Eritrea lies on the north-eastern coast of Africa, bordered on the north-east side by the Red Sea. The country has land borders with Djibouti to the south-east, Ethiopia to the south, and Sudan to the west. Eritrea existed as an autonomous entity until it federated with Ethiopia in 1952. This was followed by annexation by Ethiopia in 1962 and a lengthy armed struggle. In 1993, in a referendum supported by Ethiopia, Eritreans voted for independence. 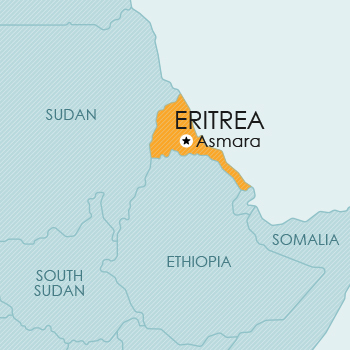 Border issues still exist between Eritrea and Ethiopia, which hamper socio-economic development. After gaining independence from Ethiopia in 1993, Eritrea no longer recognised trade mark rights acquired in terms of Ethiopian law. No legislation has been enacted to remedy the situation and it is, consequently, not possible to obtain registered trade mark rights in Eritrea. The Government of Eritrea, through no official mechanisms, permitted the publication of cautionary notices in government-owned newspapers until August 2009. A moratorium was placed on this practice by the Eritrean Government (specifically the Ministry of Information), for political reasons. It is expected that the situation will change in the not too distant future. Eritrea was a province of Ethiopia and became independent of Ethiopia in May 1993. No patent protection is currently available in this country. Eritrea was a province of Ethiopia and became independent of Ethiopia in May 1993. No design protection is currently available in this country. There is no copyright legislation in Eritrea at the present time. Eritrea has also not acceded to the Berne Convention yet, so that there is no certainty about the protection of copyright in Eritrea. It has not been possible to determine whether or not, currently, plant breeders’ rights or other sui generis protection for plants are available in Eritrea.